When you grow up on Long Island, New York the water is a big part of your life. The Island is completely surrounded by water from the NYC line out to Montauk Point and Orient Point on the easternmost boundaries. It is no wonder that many Nassau and Suffolk County brides and grooms wish to have their wedding celebrations at waterfront venues. One of the finest, and one of my favorites, is Land’s End in Sayville, NY. This spectacular waterfront venue is located right on the shore of The Great South Bay and offers a wonderful waterfront dining and party experience. The ferry to Fire Island leaves a dock right next door to Lands End and adds to the relaxed atmosphere of this beautiful catering facility. The wedding picture you are looking at right now was taken on the private beach belonging to Land’s End. 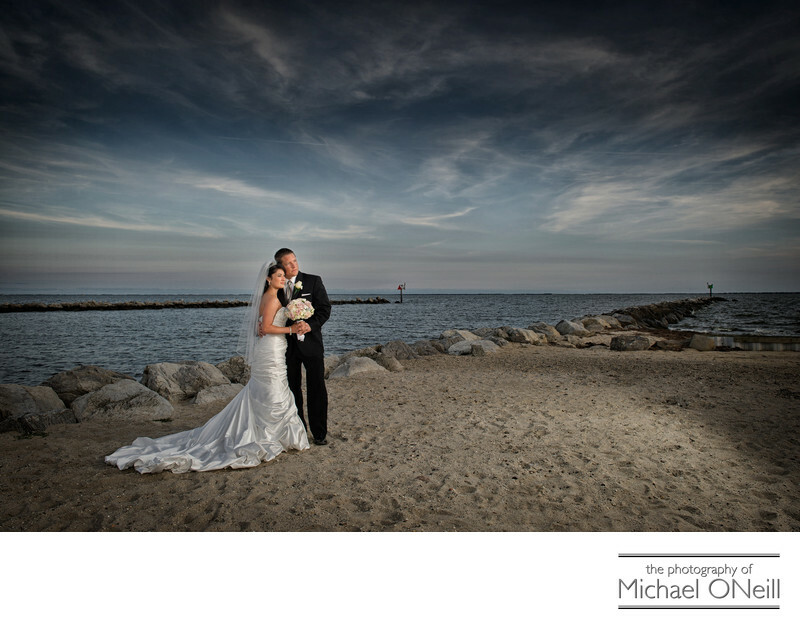 This image was created just as the sunset was happening and the sun setting on this slightly overcast day offered up beautiful soft lighting for this beach front portrait. Waterfront catering venues line both shores of Long Island. Some of my favorites include The Venetian Yacht Club in Babylon, NY, Lombardi’s on the Bay in Patchogue, NY, The Crescent Beach Club in Bayville, NY, Chateau La Mer in Lindenhurst, Gurney’s Inn and The Montauk Yacht Club in Montauk, Oceanbleu at The Westhampton Bath and Tennis Club, The Allegria Hotel in Long Beach, Lombardi’s on the Sound in Port Jefferson and The Harbor Club at Prime in Huntington. I have had experience working at all of these beautiful waterfront venues and would love to work with you on your big day. Give me a call at my East Northport studio and gallery and we’ll get together to discuss your plans for your big day.